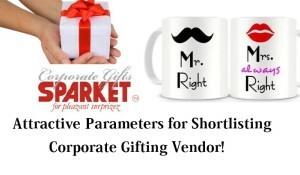 Parameters for Shortlisting Corporate Gifting Vendor! First and foremost, you should look for a vendor who is in the business for over 3 to 5 years as the churning in this business is very high and you should avoid dealing with a half learned entrepreneur who is going to do trial based on your order and end up cutting a sorry figure. Again avoid giving large and new items order to a new vendor as the experience for everyone involved may not be too good! With an experienced vendor the chances of nasty surprises are less as over the years they have picked up experience and good exposure to what not to do to keep you meaningfully satisfied. Always better to start with small orders and slowly build the trust and confidence in the capability of a new vendor to avoid nasty surprises. Always look out and work with an empowered team against one man show operations as that ensures the bandwidth of the vendor is very high resulting in mega benefits for your organisation. The bare minimum advantage of a team is more variety of the products and access to a knowledge pool which makes it easy for the team to come with solutions and viable finished samples at the most cost effective rates and scope of fulfilling deliveries within the assured timelines. Purchase department are experts in sourcing and getting the best deal by preparing a vendor data bank which includes the last minute and additional requirements at short notices. But sourcing of corporate gifts becomes a big challenge for them too as they have been trained and have mastered the art of buying items which they need on a regular basis. But in corporate gifting the item changes every time with different quantities, different branding and with different packaging making it difficult for them too to have a good systematic control over the one time buying process with manufacturing units which are not even present on their existing or known radars. Here the expertise and long working experience of established corporate gift vendors comes handy as they become outsourced partners of your purchasing department for all such one time activities which is required by your sales, marketing, hr and admin departments. Where the volumes are pretty large round the year we at Sparket Corporate Gifts also offer the services of authorized sourcing agents in a transparent manner on a mutual agreed formula or terms. India is very cost effective on all handmade items and a viable reliable cost effective source for the global procurement of the MNCs! Good intentions with professionalism of the vendor is a good way of making sure that you are in safe hands and that the vendor will always ensure that calculated risks are being taken to keep all constituents happy. Whenever a new or difficult project is undertaken then every aspect of the risk is discussed and explained so that the team from both the sides are well prepared for the best and worst outcome. This relationship is required to create and execute new ideas to capture the market share in the competitive world. We have already mastered and always make sure to keep learning ways and means to keep our corporate buyers happy and excited with new ideas, concepts, choices to help them increase their sales and relationships with their target audience.